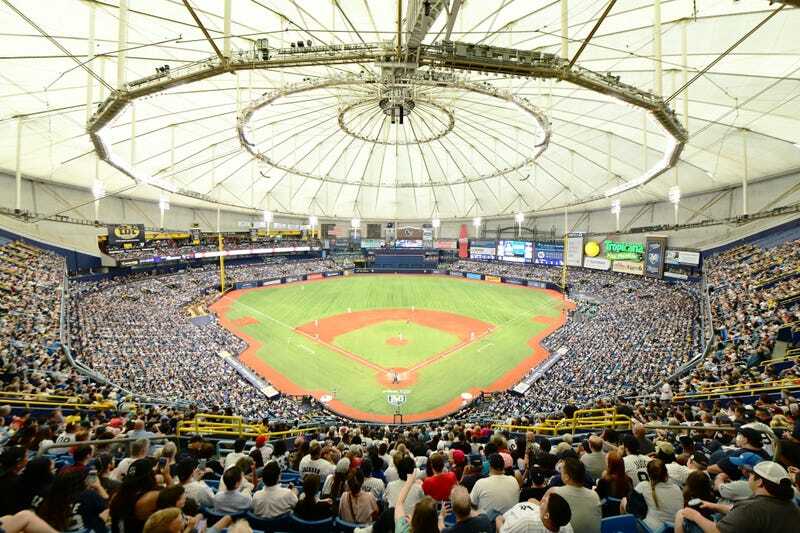 The Tampa Bay Rays’ attendance issues are well-documented. So that’s likely to be the most prominent framing for stories about the team’s announcement today of an offseason stadium renovation that will reduce seating capacity by more than 5,000. And, sure, that’s embarrassing, but Rays ownership would very much prefer you focus on that rather than the immediate practical outcome of these changes: It’s going to cost more money to go to a Rays game. “Intimate,” that buzzword used by every team that moves to a smaller stadium, or renovates its existing one to have a smaller capacity—or just dreams of doing so. It’s about the “fan experience,” you see. Unless the fan experience you’re looking for is buying the cheapest ticket possible because sometimes it’s fun to go to a ballgame and sit in the nosebleeds and eat a dang hotdog. So which seats, exactly, are the Rays getting rid of? The upper deck was sparsely populated, but it was always there if you wanted it. The team claims the “cheapest price point” from last season will be maintained in 2019, but it does not say how many seats will be available at that price, or where it will be located. Rest assured that the average ticket price will be going up. This serves the Rays on every end. They don’t have to worry about hiring people to handle concessions or security or infrastructure for an entire section, so it’ll be cheaper to host each game, even as the day’s gate is higher than it would have been before the elimination of the 300 level. This isn’t just the Rays—it’s where the trend in stadium construction has been headed for a long time—but it’s especially glaring here, with a team that can’t build the new stadium it so desperately desires trying to jury-rig those new-stadium functions into its old concrete piece of crap. That means fewer seats, fewer cheap seats, and, above all, more “premium” seats—like the new section being introduced next season that includes “a full-service bar, ledge tables and seated drink rails.” Oh, and “a full view of the field,” if you happen to care about that sort of thing. ● Offering more social gathering spaces with the creation of a new common area, the Left Field Ledge. ● Redesigning and enhancing two primary fan entrances (Gate 4 and 5) to improve the flow of fans through increased access points and wayfinding features. ● Exchanging the current turf for a new Shaw Sports Turf product, designed to withstand the myriad events held at Tropicana Field throughout the year. ● Adding access from the Budweiser Porch and Ballpark & Rec areas to the Outfielder bar behind center field, as well as creating an external entrance to the food and beverage space. ● Redoubling the organization’s commitment to sustainable energy practices by replacing the existing field lights with energy-efficient LED lights, improving overall on-field playability and entertainment lighting throughout the ballpark. ● Elimination of the upper deck, which reconfigures the ballpark seating areas to include the first, mezzanine and second seating levels, as well as the new GTE Financial Party Deck. This will bring all fans closer to the field of play.